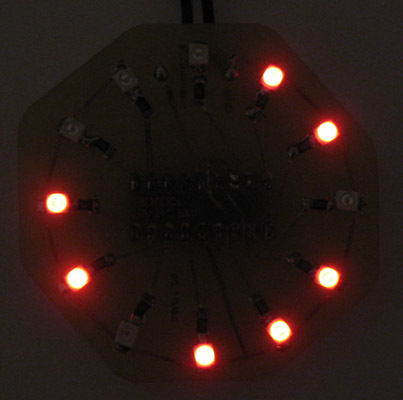 This project uses the Simple LED Animation Kit (SLAK post or page) with the LEDs arranged in a circle around the PIC16F628A. I decided to do this project after picking up some red SMD LEDs at HSC in Santa Clara, CA, last week. Although the only difference from the basic SLAK is the board design, I find that this layout to be have the potential to be more useful. It could easily be a medallion on a necklace. If I had blue LEDs this would go well in an IronMan Reactor Core package. 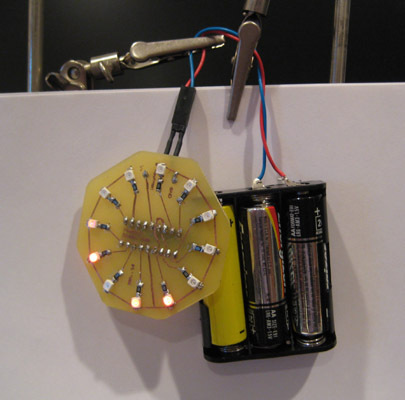 This board only needs 4.5V and in the video is running on only 3 AA batteries. You can see that the PIC is still in a socket. If anyone is interested, I can easily change the SMD parts to thru-hole parts and post an updated board. I am still refining the current set of animations for both a linear (straight line) arrangement and a circular arrange. I need to tailor the ones running on this board for a circle only. OK, so that sounds a little cryptic. What I really mean is that I want to take out the ones that don't look good to me. And maybe add some more. By the way, each animation has a name. One of the next things on my list is to take this same arrangement and use three different LED colors, four red, four green, and four blue or maybe yellow. Then I will spend some time creating animations that highlight the color possibilities. What are the details of the LED's in use and the Resistors? 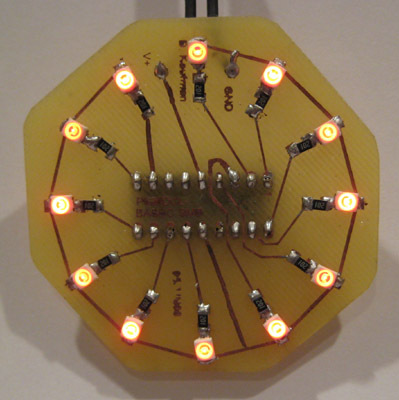 if this was SMT what would the LED's and the resistors be? You need to assemble the medallion.asm file. This file includes the LEDDirectDrive.asm file. I think you are trying to assemble the LEDDirectDrive.asm file directly. Executing: "C:\Program Files\Microchip\MPASM Suite\MPAsmWin.exe" /q /p16F628A "LEDDirectDrive.asm" /l"LEDDirectDrive.lst" /e"LEDDirectDrive.err" /o"LEDDirectDrive.o"
Very cool project. Do you update your blog anymore? 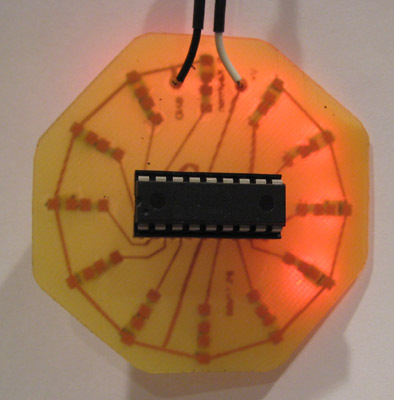 LEDDirectDrive.asm is included by Medallion.asm. You only need to build Medallion.asm. I have emailed you the medallion.hex file. It might be helpful if you just put the Hex file on the download page. It then compiles however I can't get the last 6 bits to display no matter what I try. I am using mplab 8.53 any suggestions? plz sent me hex codes of the project.